That’s why back in January I wrote a post about my writing goals for 2017. To give myself some accountability, and to have something to measure myself against at the end of the year. And a bit like reading an old diary, it’s fun to look back and see what I was thinking a few months ago. In HR, we always used to preach that objectives are only useful if they’re regularly reviewed. And though I no longer have a ‘boss’ to sit me down for a bi-annual appraisal, that doesn’t stop me from rating myself. So let’s see how I’ve done so far this year. Target 1 – Edit & publish Summer’s Lease, the first in my new series. Result – Done and dusted. Well almost. The book is fully edited and will be released on July 13th this year. It’s already getting some lovely reviews on Goodreads, and is available right now to pre-order for 99p / 99c. Target 2 – Revise & submit A Winter’s Tale – the second in my new series. Result – achieved. In fact, I think I overachieved this one. Not only has it been submitted, but it’s been through revisions, line edits & copy edits and is just awaiting a proofread. It will be released in November, and I can’t wait for people to read this one! Result – target achieved. I spent most of the first 3 months of the year writing this book (tentatively titled Absent in the Spring), and since then have set it aside. One of my targets for the next couple of months is to revise and submit it to my publishers. I’m slowly learning to love the revision process (or certainly the outcome) but it’s still damn hard work. Wish me luck! Result – partially achieved. I talked in this post about an author signing I attended in Newcastle, which was amazing. I also got to network with some fabulous authors at the RNA Summer Party, and at Goldsboro Books’ Romance in the Court. In August I’ll be attending Chaptercon, a multi-author/reader/blogger event in London, and I’ll be going to my first RNA Summer conference, too. In 2018 I’ll be attending a number of author events, and I’m really excited about them! So What Haven’t I achieved? But my biggest goal, and one I haven’t spoken about much yet, is that I need to really working on marketing these books. I’ve started to work with the fabulous Social Butterfly PR, who will be helping to coordinate the release of both Summer’s Lease and A Winter’s Tale, along with helping me plan sales, special events and other things to make my readers happy. By the end of 2017 I’ll have 6 books published, with at least another 2 to come in 2018, and it’s time to make sure they get as much attention as my new projects do. Balancing writing the next book with marketing my backlist is always a hard job, but one I’m determined to work on in the latter part of 2017. Want to know how I get on? Check back in December for my review of 2017! So that’s it for my half-yearly review. After that I think we all deserve a drink down the pub. I’ll buy the first round, see you there! I’m so excited to share the cover of T.M. Franklin’s upcoming pirate adventure, CUTLASS! Sarina Talbot is certain notorious pirate, One-Eyed Jack Tremayne, murdered her father and stole his prized cutlass. Out for revenge, she sneaks onto his ship disguised as a cabin boy, but Tremayne quickly catches on to her scheme. He claims she has the wrong man, and that, if they work together, he can help her gain the vengeance she seeks. She doesn’t really trust him, and he doesn’t trust anyone. But they need each other to find the killer, and their uneasy alliance slowly turns to friendship, and then to more. Add in an old journal full of cryptic clues leading to a hidden cache of Aztec gold, and Sarina and Tremayne have their hands full. Between sword fights, Crown ships, enemy pirates and a traitor on their own vessel, they’ll be lucky to escape with their lives, let alone the gold. But perhaps, along the way, they’ll find a treasure even more valuable. 5 Reasons Why I’m Excited For Summer! I’m British, which means I’m obsessed by the weather. It’s a national pastime that I’m more than willing to take part in — be it complaining about the rain, or speculating about the possibility of snow. But when the sun comes out, I tend to go into overdrive. Sunny weather is my happy place. It means long days out on our deck, with an ice-cold cocktail in one hand and a summery book in the other. Summer is about vacations and the sea, the beach and a barbecue. More than anything, warm weather is about spending time with family and friends — and it doesn’t get much better than that! So since the sun decided to take a peek out from behind the clouds this weekend (and as I write, my weather app is telling me that by the time this blog is posted the rain will be back — sorry!) I decided it was high time to write a summery blog. So read on to find out my FIVE favorite things about summer! I’m one of those crazy people who love salads. Now don’t get me wrong, it’s not about being healthy or calorie counting. After all, my favorite kind of salad comes doused with dressing and with a side of french fries. It has to start out with a base of green salad leaves, then a healthy sprinkling of onion and cucumber. On top of that I love me some croutons and maybe some cajun spiced chicken, as well as a creamy dressing — be it caesar, thousand island or just yummy french oil. It has to be hearty, tasty, and full of the taste of summer. Delicious! There are so many different drinks that really come into their own in the summer. If you like your refreshment with alcohol, then Pimms is definitely the queen of summer drinks. This quintessential British punch-style drink is based on gin and red vermouth, with a large douse of lemonade, all poured into a jug filled with mint, strawberries, cucumber and apples. And it tastes absolutely delicious. But Pimms isn’t the only good drink to have on a hot summer’s day. There’s also Prosecco, margaritas, and of course an ice-cold beer. All these things make me feel very happy indeed. For me, summer isn’t complete without a lovely summery story in my hand. Preferably set on a beach, with a pretty girl and a gorgeous guy who try to deny the attraction between them. This year there are a whole load of summer books being released — from Holly Martin’s Summer at Buttercup Beach to Heidi Swain’s Coming Home to Cuckoo Cottage and Sarah Morgan’s Holiday in the Hamptons. Oh, and did I mention I have a summer book coming out too? If you enjoy love stories set in Italy, with good food and a splash of wine (do you sense a theme here), along with a movie-star hero and a smart mouthed English writer, then check out Summer’s Lease. Summer movies are all about sun, sand and lots of love. The first one that springs to mind is the iconic Dirty Dancing. An uptown girl and a downtown boy meet at a Summer Vacation spot, and love grows on the dance floor. I won’t mention the remake (because really, no), but the original is well worth a re-watch. But if Baby and Johnny don’t do it for you, then check out Grease, Roman Holiday, One Day or Mama Mia, all of which feature scenes in the hot summer sun! Where better to enjoy summer food, drink, books and movies than on vacation? I love going on holiday with my family — it’s a chance to kick back, relax and spend quality time with those I love. Whether it be in Spain, Turkey or Italy (our most recent three vacations) the real draw of a holiday is being able to take ourselves away from real life and all the worries it brings, and start to relax, if only for a couple of weeks. So those are the reasons I love summer. How about you? Are you a sun lover or more of a spring person? Let me know in the comments, or send me a tweet! Last year I was proud to be part of a charity anthology raising money for MIND, a wonderful mental health charity here in the UK. This year I’ve teamed together with 13 other authors to raise money for another deserving charity – the NSPCC (a national children’s charity). Each of us have written a short story that revolves around bullying from different perspectives. The book will be released on November 14th, but is already up for pre-order here. 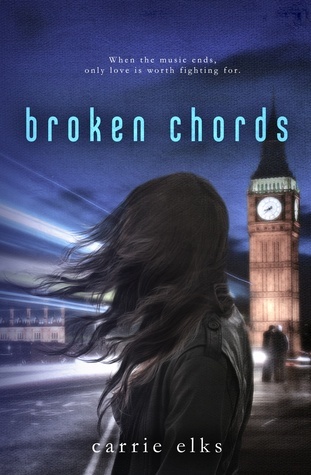 I’m running a giveaway for a paperback copy of my new book, Broken Chords. The giveaway is valid world-wide, and will end on February 27th (the day after release day). So run over and enter now!